Ramgiri’s (born Andreas Braun) spellbinding journey from the aftermath of the Holocaust in Germany to the legendary Indian sage Neem Karoli Baba, Maharajji, to the Concentration camp of Auschwitz and into the depth of the heart is the ultimate adventure, which we all take in our own way. His message is nothing less than the liberation from all fear and pain into Self-realization. 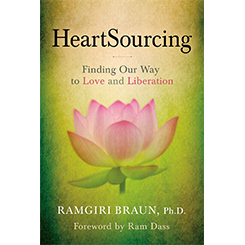 HeartSourcing takes us to the Source of that one supreme remedy - to live out of the inexhaustible core of the Heart. No matter how dark the valley you may find yourself in, HeartSourcing offers a path back up into the light.